The Lyman Alpha Mapping Project (LAMP) measurements of the sparse layer of molecules temporarily stuck to the surface helped characterize lunar hydration changes over the course of a day. Geophysical Review Letters – Diurnally?Migrating Lunar Water: Evidence from Ultraviolet Data The amount and locations vary based on the time of day. This water is more common at higher latitudes and tends to hop around as the surface heats up. Scientists have hypothesized that hydrogen ions in the solar wind may be the source of most of the Moon's surface water. With that in mind, when the Moon passes behind the Earth and is shielded from the solar wind, the "water spigot" should essentially turn off. However, the water observed by LAMP does not decrease when the Moon is shielded by the Earth and the region influenced by its magnetic field, suggesting water builds up over time, rather than "raining" down directly from the solar wind. 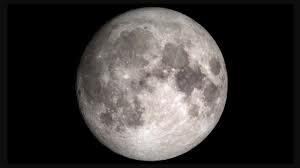 "These results aid in understanding the lunar water cycle and will ultimately help us learn about accessibility of water that can be used by humans in future missions to the Moon," said Amanda Hendrix, a senior scientist at the Planetary Science Institute and lead author of the paper. "Lunar water can potentially be used by humans to make fuel or to use for radiation shielding or thermal management; if these materials do not need to be launched from Earth, that makes these future missions more affordable."